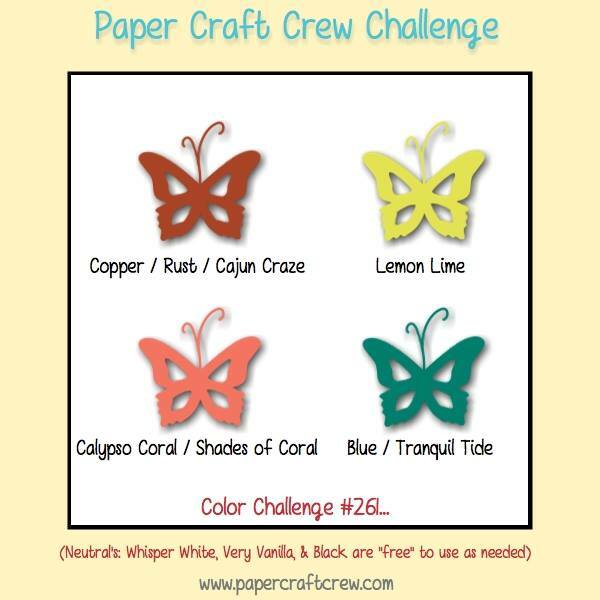 Welcome to this week’s Paper Craft Crew Colour Challenge! For this week’s challenge, you can choose to use all 4 colours, or at least 3 of the 4 colours shown. Neutral colours, such as white, vanilla or black are all ‘free’ to use, as needed. The design or layout you use is completely up to you! I was originally going to use only 3 of the colours, but I went ahead and used all 4 after all! I had just received my Painted Harvest stamp set, so I really wanted to use it! I thought it would work quite well, as I think that the flower resembles a sunflower. This set is a multi-step stamp, meaning that each image has at least 2 steps to complete the image. For the flowers, I first stamped in Calypso Coral ink with the 1st layer, then the 2nd step was stamped in Cajun Craze ink. The centre of the flower is stamped in Soft Suede ink, with the ‘seeds’ stamped in Chocolate Chip ink. When stamping the flowers on the Whisper White panel, I first stamped a flower onto scrap copy paper and cut it out (no thinlit or punch for this flower!) to use it as a mask. Masking off the flowers when stamping allowed me to stamp them so it looked like one is behind the other, the the leaves behind the flowers. The 3rd flower was stamped onto a separate piece of Whisper White, and cut out by hand, so that I could layer it on top of the stamped images. For the leaves, I first stamped in Lemon Lime Twist ink, the stamped the 2nd layer in Tranquil Tide. I quite like how they work together, don’t you? I used the new Leaf Punch for the leaves that are layered under the popped up flower. Good news – you can purchase the Painted Harvest stamp set and the Leaf Punch as a Bundle – and SAVE 10%! The large sentiment was stamped onto Whisper White cardstock in Cajun Craze ink, and the new Layering Labels Punch used to punch it out. 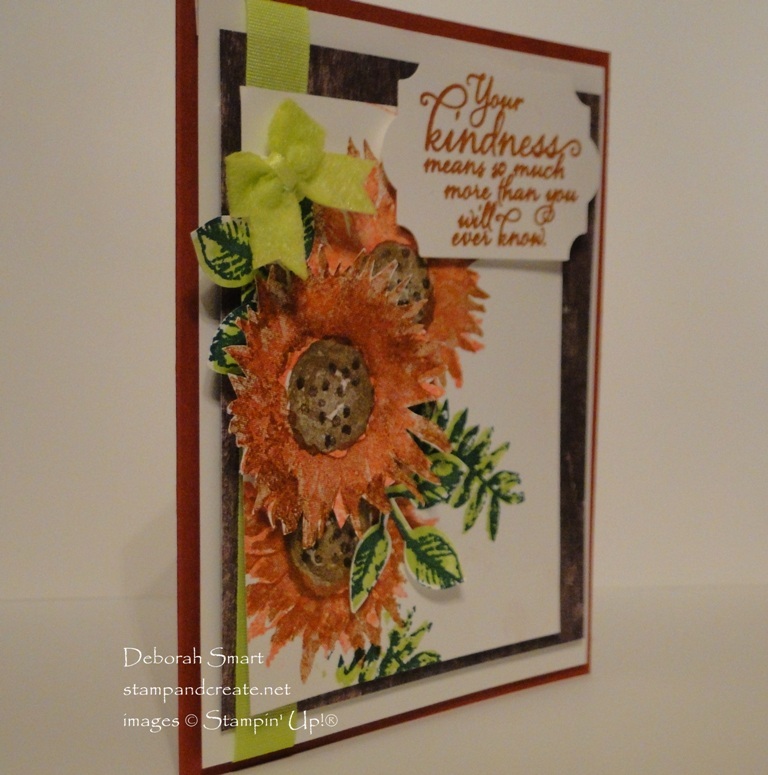 First, I attached the hand cut flower to the stamped panel with Stampin’ Dimensionals. The leaves were added using Mini Glue Dots. Dimensionals were used to attach the sentiment. A 4″ x 5 1/4″ panel of Whisper White is attached under a 3 3/4″ x 4 3/4″ panel of Wood Textures Designer Series Paper. Then, a length of 1/2″ Finely Woven Ribbon in Lemon Lime Twist is wrapped along the left hand side, and glued at the back. After this, the main panel is attached, with more Dimensionals. The card base is an 8 1/2″ x 5 1/2″ piece of Cajun Craze cardstock, scored and folded in half at 4 1/4″; the panels are added to it. Finishing off the card is one of the 2017-2019 In Color Bitty Bows, in Lemon Lime Twist. 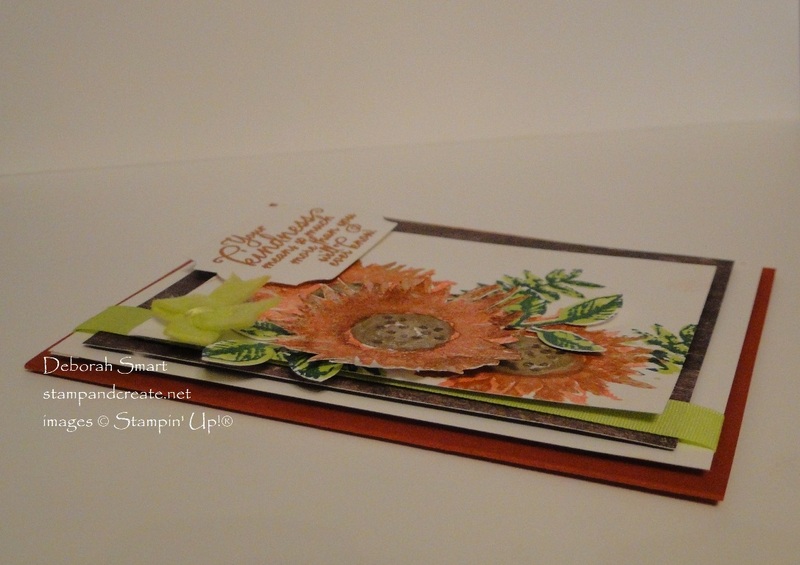 I love the depth created not just by the layers, but by the multi-layer stamping. This is an awesome set that can be used for just about any occasion! You can recreate this card yourself! Click on the images below to order the supplies used. Or click on my signature, to go to my store to browse for other products! Previous Previous post: Only 1 Week to Join! Next Next post: October Specials For You! Your card looked beautiful from the head on picture but when you posted the side picture, it really was gorgeous! 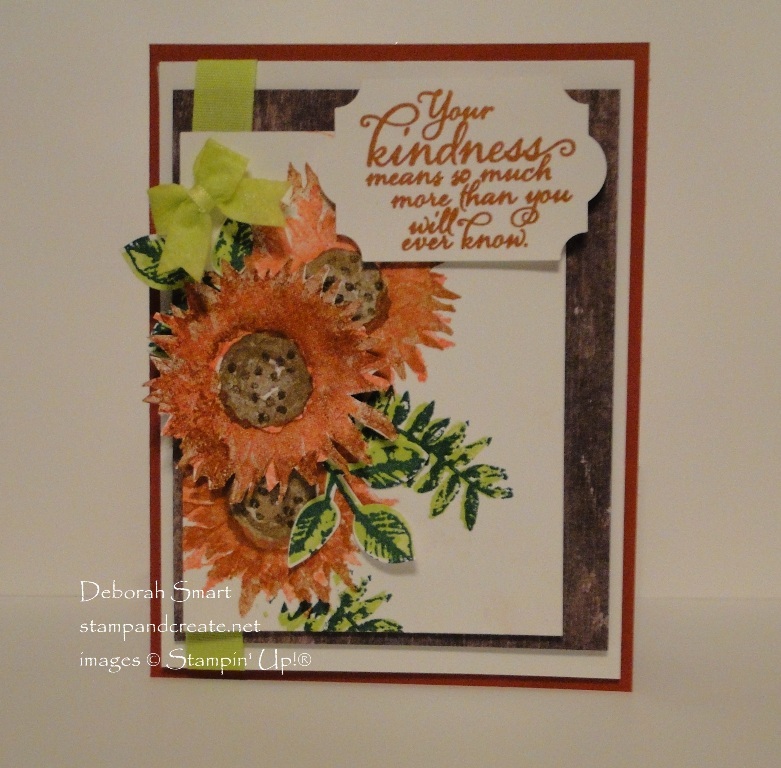 Beautiful card, Deborah! Love all the depths and layers. goodness! That sunflower card is gorgeous! Who wouldn’t feel special receiving that? Awesome job!